The R170 features a hollow channel carbon sole for stiffness and lightness and a supple, ventilated synthetic/mesh upper. 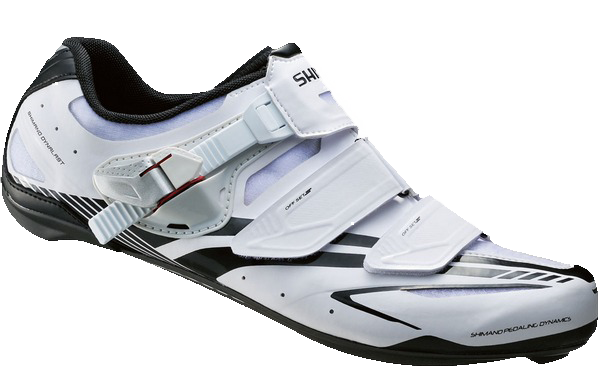 I first tried these shoes on this ride. They have lots of ventilation mesh in various places and when I started riding I could feel it working. I was worried that my feet would get cold, but quite soon into the ride my feet were nice and warm even though the day was a bit nippy. There is a quick-release buckle that enables you to make fine adjustments to the tightness while riding. So far, the only issue is that part of the tongue sometimes digs into my foot. I’ve found that this can be rectified by moving the tongue over to one side before tightening the strap. Hopefully this problem will either go away or I’ll get used to aligning the tongue each time I put them on. It’s just a slight irritation on an otherwise excellent lightweight shoe. Addendum (5/5/14): Just rode 74 miles in these. Really comfortable, temp just right!